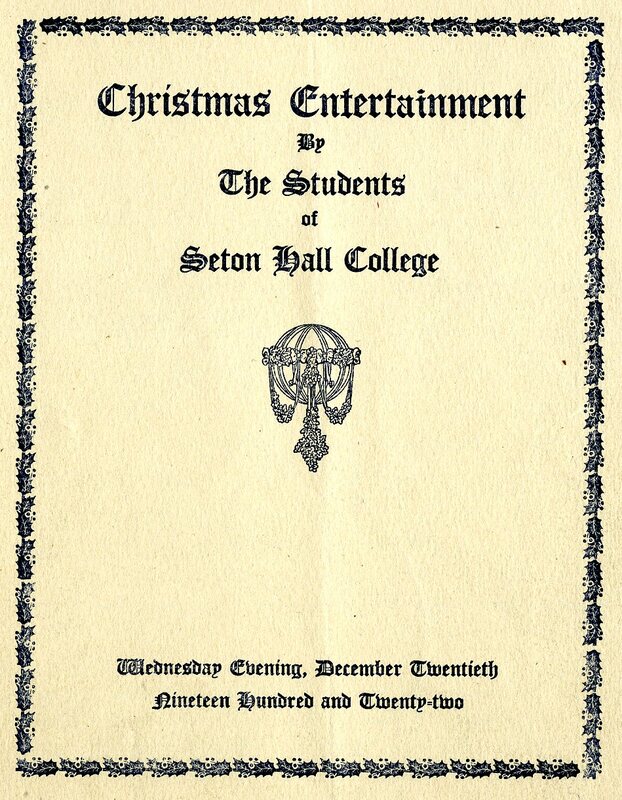 Seton Hall has long built a tradition of marking the Christmas season in varied ways including observance of Advent, Midnight Mass, a live Nativity Scene and in recent years the ceremonial tree lighting have brought the community together in celebration of the season. 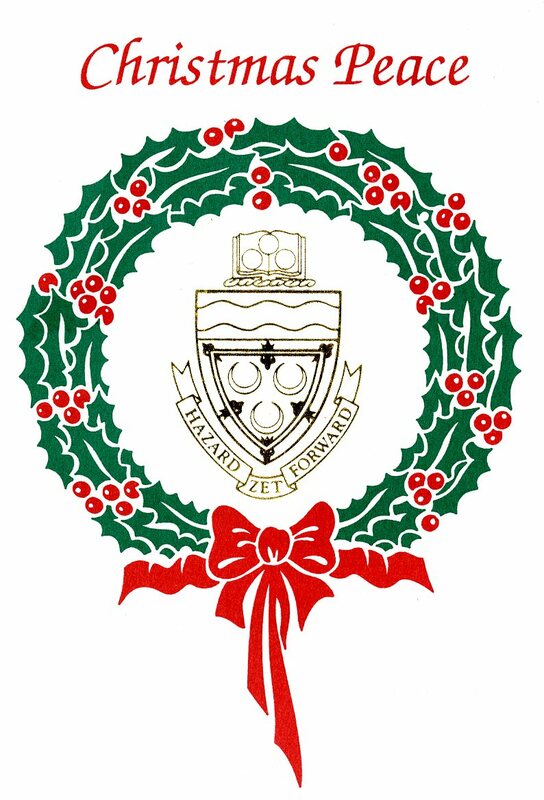 Among the most memorable traditions found in the early days of school history included an annual musical Christmas program(me) which showcased the theatrical talents, voices, and instrumental prowess of the student body. 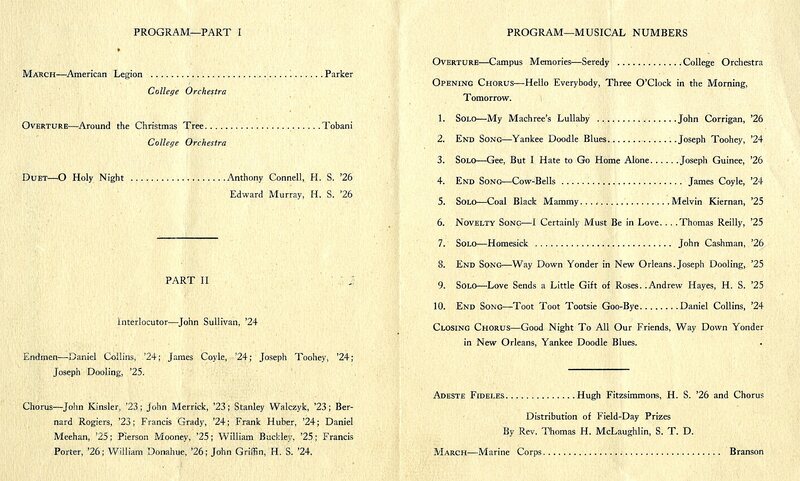 Included here are examples of the entertainment fare offered to the audiences who were there to share good cheer which did not always offer traditional carols, but rather an eclectic mix of different song titles and themes designed to entertain and inspire those in attendance. 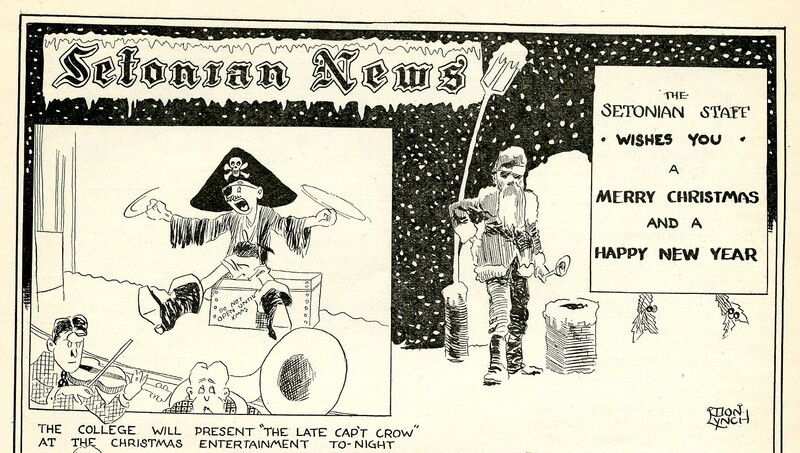 Interestingly, it was in 1930 and the yule-time production of “The Late Cap’t Crow” where the first documented appearance of a Pirate on the shores of Setonia came about as shown in the pages of The Setonian around four months prior to the adoption of the legendary school nickname. Santa Claus would share space on campus with the Pirates from this time forward. Over subsequent Christmas celebrations more traditional holiday-themed events took place after World War II such as traditional holiday parties, concerts, and the like would become more commonplace. The true spirit and meaning of Christmas is timeliness for many people. This not only present in a religious sense, but also in popular culture circles. 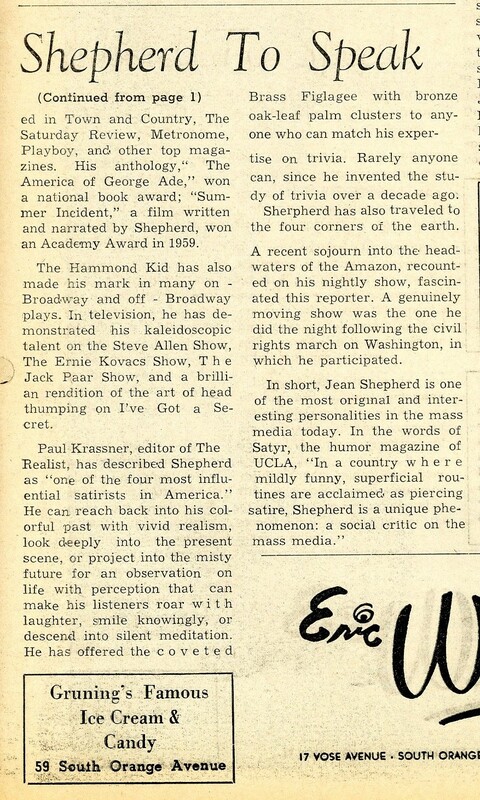 For example, how many of us have ever watched the movie “A Christmas Story” and saw Ralphie’s quest for the Red Ryder B-B Gun while being roundly warned – “You’ll Shoot Your Eye Out Kid!” This endearing tale is not only popular among Setonians, but also the wider world through the pen of legendary writer and raconteur Jean Shepherd who not only narrated this movie, but wrote this treatment based on his early life under the original title – “In God We Trust, All Others Pay Cash.” Shepherd was an author, television, and radio personality who had a popular show on W-O-R radio in New York City for a number of years between the 1950s-70s and made regular appearances on the Seton Hall campus (including a mid-December gig in 1965 as heralded below) during these years in the limelight whose time on campus are still remembered fondly by those who saw him in concert. 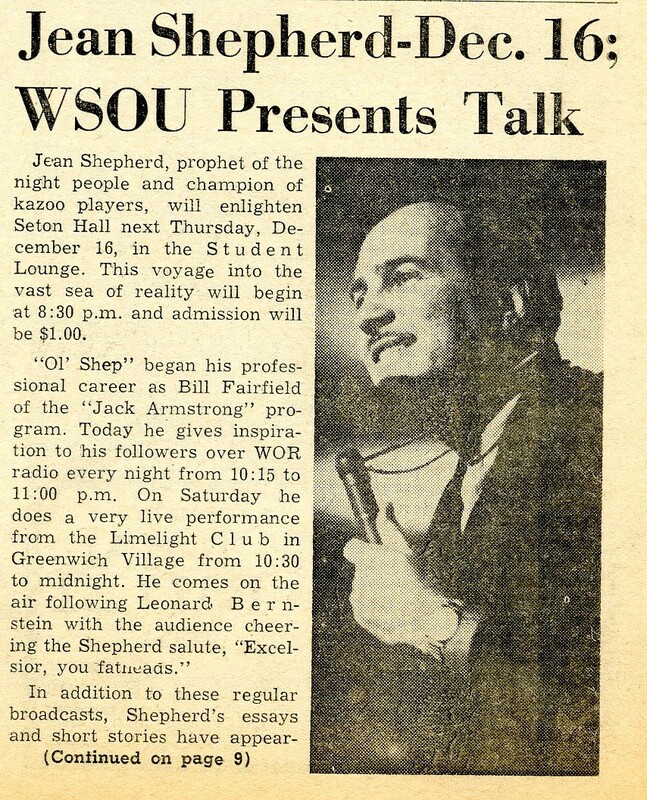 Please click here to listen in on Jean Shepherd announce his date at Seton Hall on 12/16/1965. 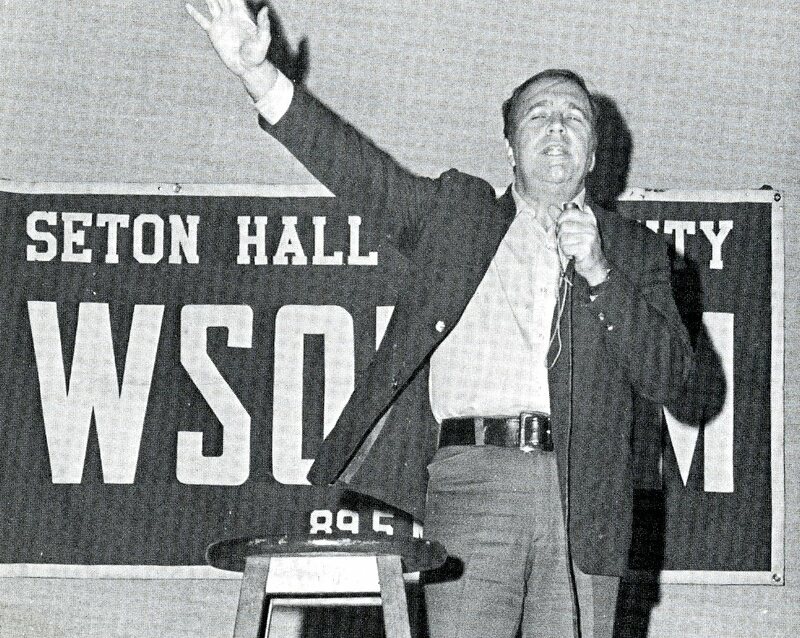 Beyond the stage and regardless of the era and how the season was celebrated, Seton Hall has its own traditions in the art of holiday cheer and commemoration from Cap’t Crow to those who are writing their own “Christmas Story” at Seton Hall.